I am pleased to announce the publication of our 2016 annual report. 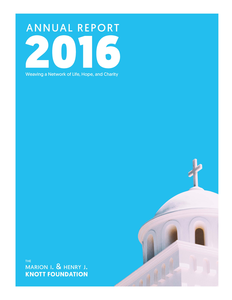 “Weaving a Network of Life, Hope, and Charity” is the theme of our 2016 annual report. Through this theme we remark how organizations across the Archdiocese of Baltimore are weaving the threads of life, hope, and charity to create a more vibrant social fabric in the communities we serve. Our annual reports are a wonderful archival resource of the Foundation’s grantmaking activities, as well as a way to learn about the positive impact of some of our recent grants in education, human services, health care, arts & humanities, and Catholic activities. For a collection of our past annual reports click here. I hope you enjoy reading our 2016 annual report and learning more about the Knott Foundation’s mission to strengthen the community.